Give a gift that your family and friends will appreciate year-round! Floor Mats and Cargo Area Mats will help keep a vehicle's interior looking like new. For serious protection against winter grime and spills, choose Aries Style Guard, Outland Deep Tread, Wade Sure Fit or Westin Profile rubber Floor Mats. Precise laser measured fit, breathable layers, raised edges, factory retainer hook connections, and shape retention under heavy loads/extreme temperatures are just some of the features built into mats RockAuto carries that ensure they fit, last, protect and make interiors look polished. For an exact match to a vehicle's carpet, choose die cut ACC carpet floor mats, available in a wide variety of OE yarns and colors with the option to add logos (Buick shield, Charger R/T, 4X4...) available for some models. Through February 28, 2018, take advantage of Westin's Winter Rebate which includes Profile Floor Mats (up to $15 back!). 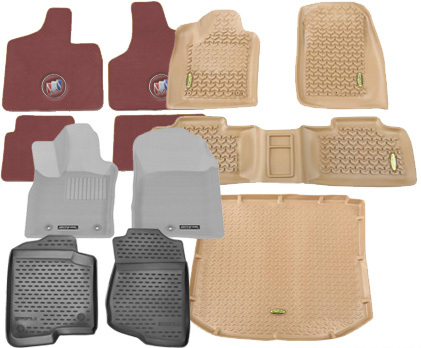 Find the Floor Mats and Cargo Area Mats we have for specific vehicles in the "Interior" category of the RockAuto catalog. Need gifts for clients or coworkers that are useful and make a good impression? SolarGuard Windshield Covers are effective, premium quality and Wholesaler Closeout priced at less than $4! SolarGuards are individually boxed; even the packaging is classy! 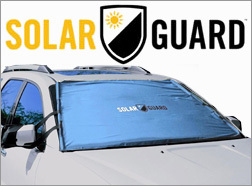 Find your SolarGuard Reflective Sunshade Windshield Cover under Window in the "Accessories" category of the "Tools & Universal Parts" tab or simply click here. Make your gift giving easy this year with a RockAuto Gift Certificate! A Gift Certificate will let the recipient get the parts or tools he/she most needs! They are available for any amount, are easy to purchase and even easier to use!